Vaccines have wiped out smallpox and they’ve nearly eradicated polio. Vaccination can control measles and mumps, and they protect travelers against yellow fever and cholera. Most are so good that a few doses in childhood cover people for decades, even life. But there’s one vaccine that people have to get every single year, and even then it’s not guaranteed to fully prevent infection. It’s the flu shot, and scientists are struggling to find a way to make a better one. Debbie Fauver believes in flu vaccines — so much so that she brings home a batch of syringes to immunize her family every year. She’s a nurse, working at a hospital in Greenville, Ky., and vaccinated her grown children and husband last November. She was surprised when her 25-year-old daughter Molly got the flu anyway. “It hit her quick," Fauver told NBC News. Molly developed back pain, chill and a fever of 101 degrees. Knowing prompt treatment can make a difference, Fauver advised her daughter to visit a doctor right away, where an on-the-spot test confirmed she had influenza and she was treated with a pill called Tamiflu. “The doctors seem to think that her flu strain probably wasn’t covered in the flu shot,” Fauver says. That’s one possibility. Flu mutates like crazy and there are dozens of different strains, and hundreds of possibilities. In any one season three to four strains could be circulating and making people sick, which is why this year’s vaccines protect against three or four strains — H1N1, H3N2 and either one or two B strains. “There’s a little bit of a guessing game each year. Sometimes it’s not a good match,” says Dr. Alicia Fry, a physician with the Centers for Disease Control and Prevention’s Influenza Division. But even when the vaccine is a close match — when the virus strains that are infecting more people are the same strains used to make the vaccine — some people get sick even when they have been vaccinated. The CDC usually reports in mid-February on how well that season’s vaccine is performing. This year so far, virtually everyone who has had influenza, had it tested and had it typed has had H1N1 flu — a strain that’s included in the vaccines. It's been about an average flu season, and flu seems to be on the wane, but 40 children have been reported killed by the virus so far this year. In 2012, CDC says, the flu vaccine kept 80,000 people out of the hospital, even though just 45 percent of Americans who should have been vaccinated did so. At a 70 percent vaccination rate, 110,000 more people would have been spared a hospital visit, CDC estimates. In any given year, on average, flu vaccines are about 60 percent effective — although they’re more effective than that in children. “We are trying to understand this. We are trying to make vaccines better,” says Fry. One worrying finding that has popped up on occasion seems to suggest that people who get vaccinated every year, as recommended, may sometimes have less protection than people who don’t get regularly vaccinated. Most recent was a study done last year by Dr. Arnold Monto and colleagues at the University of Michigan, who found that people vaccinated two years in a row didn’t seem protected against flu at all. But it was a very small group of people and it would be important to do a larger study designed specifically to ask that question, Monto says. 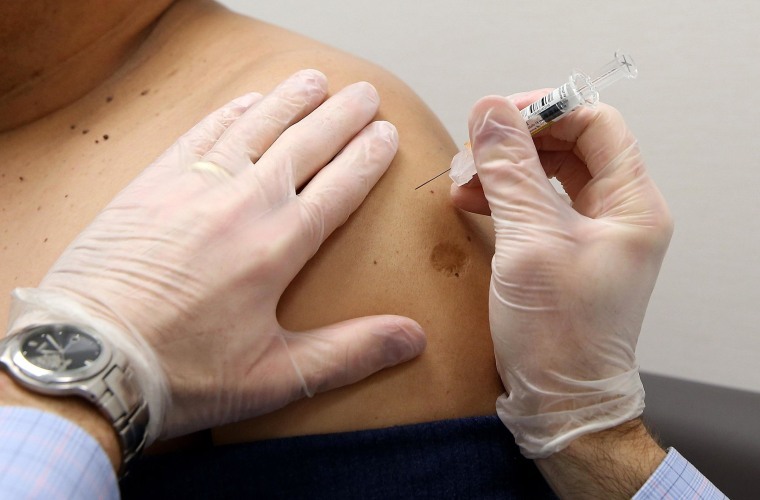 Of the 125 people who tested positive for flu, 59 percent had been vaccinated, his team found. “We all admit these are not optimal vaccines. They are the best we have." Fry notes that people who choose to be vaccinated every year may be different from people who don’t for many reasons “They tend to be older,” she said. They often have other conditions, such as diabetes, high blood pressure or asthma. “We are trying very hard to understand prior vaccination and what it really means, but I think at this point we don’t understand it and we can’t explain it in a simple way,” Fry added. One reason that it’s hard to study the issue of prior vaccination is that it’s not considered ethical to do a randomized study — one in which people are randomly assigned to either get a vaccine or not and then watched to see if they get sick, says Dr. John Treanor of the University of Rochester in New York, who helps develop and test flu vaccines. So studies have to be done in the very complicated, messy real world. People who routinely get vaccinated may be different from people who don’t. They may be more likely to report — or admit — they are ill, for instance. And other studies have shown just the opposite — that people who get vaccinated more often have better protection. That’s been shown more clearly in kids than adults. “I think the jury is still out,” Treanor said. And there is always the issue of influenza itself, changing and mutating a lot some years, and not at all in others. From the mid-1970s to 2009, more than 30 years, the H3N2 strain dominated. Then in 2009 the pandemic H1N1 swine flu, a very distant relative of the “Spanish flu” that wiped out millions in 1918, came into the mix. Last year, H1N1 didn’t do much at all. And now this year, it’s the dominant strain again. This unpredictable pattern would make it hard to advise people to do anything but just get vaccinated, Treanor says. Scientists at government agencies, universities and drug companies are all trying to solve this problem by working towards a so-called universal flu vaccine. That’s one that would protect against all, or most, flu strains. They’ve improved vaccines a little bit and this season scientists are watching closely to see if the changes have an effect. For instance, there’s a new high-dose vaccine formulated to protect seniors better. Older people who have weakened immune systems don’t mount much of a defense to disease when they are vaccinated. There are so-called quadrivalent fomulations, which protect against four different strains of flu instead of three. No flu vaccine protects people as well as a natural infection with influenza, Monto notes. But no one suggests skipping the vaccine and going for that natural infection — flu puts hundreds of thousands of people into the hospital every year, and kills anywhere between 3,000 and 49,000 people, including many young, perfectly healthy people. “We all admit these are not optimal vaccines. They are the best we have,” Fry said. The admission may provide convenient excuses to people who don’t want to get vaccinated. But CDC notes that 75 percent of the illnesses people get after they’re vaccinated are not flu, but are caused by other viruses such as rhinoviruses, coronaviruses, parainfluenza viruses and dozens more. And even Fauver isn’t put off by her daughter’s experience. “I would still take one every year and I recommend flu shots to everybody," she said.